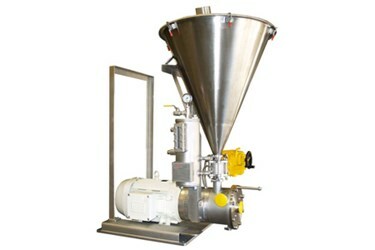 Shown is a 30HP inline SLIM Mixer with a 6 cu.-ft. conical feed hopper featuring multiple air jets and three level transmitters to automatically indicate HIGH (powder feed off), LOW (powder feed on) and LOW-LOW (SLIM induction valve off). The mix chamber is equipped with a solenoid-operated multi-position modulating valve for maintaining a liquid flow rate within 80% to 100% of the 500 gpm design flow rate. All product contact parts are stainless steel 316 polished to 150-grit (32 Ra) finish. Tri-clamp connections on the liquid inlet, powder inlet and mixture outlet allow for easy disassembly and cleaning. The mixer is supplied with a cartridge-type double mechanical seal and barrier fluid tank.